The Behringer PB1000 pedal board offers you the utmost in flexibility, allowing you to add and group effects pedals to your heart's content. Get your effects pedals wired up and ready to play at all times in thie protective, roadworthy Behringer PB1000. The PB1000 is an ultra-compact and rugged pedal board for musicians who want to pre-arrange and carry up to 12 effects pedals in a heavy-duty, yet lightweight, case designed to withstand heavy impact. The Behringer PB1000 features a generous 1.7 A power adapter and includes all cabling to power multiple stomp boxes simultaneously. When several effects pedals come together, the Behringer PB1000 definitely comes in handy. *Depends on the power consumption of the effects pedals, etc. Sound: Sound doesn't apply to a pedalboard, but it does the job to augment your sound, so I give it a 10 by default. Feature: I liked the included AC adapter and chain to save you money on powering the pedals. I also liked the way everything was neatly put together, but if you have odd shaped pedals, you'll have to find a way to make things fit and that can be somewhat of a nightmare. I would have also liked it if they had included velcro tape to make everything stay in place. Ease of Use: It's simple to put down and start making your chain. Even if you have to move pedals around, it doesn't take much to set it in a new location. Quality: It is a cheaper pedalboard made of hard plastic so don't expect this thing to take 20 foot drops. That being said, it does keep your stuff protected when closed and even though it won't take much in terms of pressure, falls, or physical force it will at the very least keep your stuff together, organized, and safe from the elements. Value: Well worth the price tag, a good buy if you're looking for a pedal board that won't break the bank. Manufacturer Support: This area is non applicable since I haven't had a need to contact them. 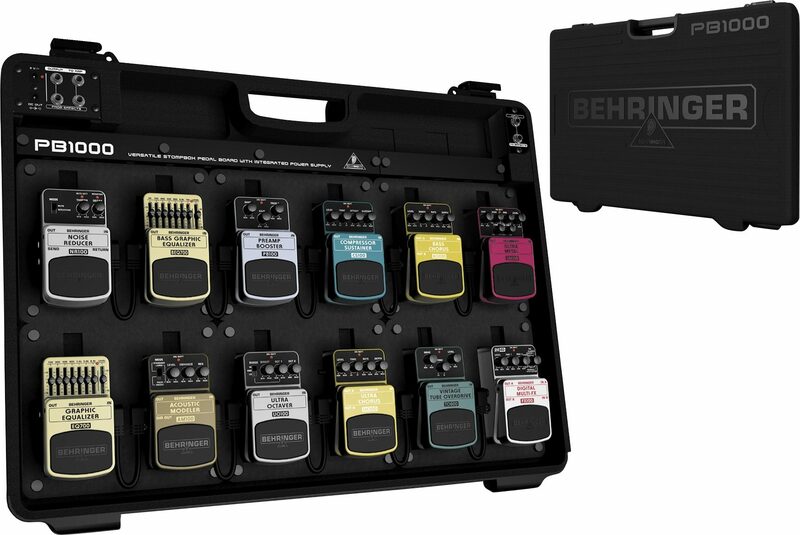 The Wow Factor: It is a nice looking pedalboard even though it has giant BEHRINGER logo etched on the outside. That isn't to say Behringer is a bad company, but it would have looked better with something more subtle. Overall: I plan to keep this until I either run out of room or have the money for a professional quality true bypass Pedalboard. Till then, this will serve me well for the weekend gigs and anything else I play. 24 of 24 people (100%) found this review helpful. Did you? Overall: I bought this pedalboard case in order to simplify my set ups. This case enables me to show up to my gig, connect my bass to it, connect power, connect the amp, and done. When it's time to go, just reverse the order, pop the lid back on, and byebye! The case itself is a hard plastic material, which appears durable but only a few months down the road will tell for sure. The case is lined with foam padding on the lid, and a dense foam material on the base side. I removed the thumb screws (loved that it has thumb screws for everything) and removed the foam cut outs, then lined the remaining pads with double sided tape so they'd stay in place without the screws. I then threw down a couple strips of velcro and I magically had a pedalboard case that could suit my needs. For the price, it's really difficult to beat all that this pedalboard case is and what comes with it. Now the stuff I really like about this pedalboard case. I really like that it comes with enough patch cables to set up 12 pedals. I also really like that it comes with a built in power supply unit capable of supporting 12 pedals via daisy chain. Lastly but most importantly I also like that it has these ports built into it so that I can set up my pedals and have it ready for a show without having to do anything else other than hooking up my bass to it, hooking up the power adapter, and hooking up the amp. The one con which I accepted was how large it is. When I bought it I was under the impression it was smaller. The pro to this is that even though the image shows 12 pedals, you have a lot of real estate an enough room to stick up 20 pedals easily! Style of Music: Christian music of all kinds like rock, pop, metal, etc.